UBCO currently has space for 1,680 students to live on campus which allows it to meet its guarantee to provide student housing to every first-year student. 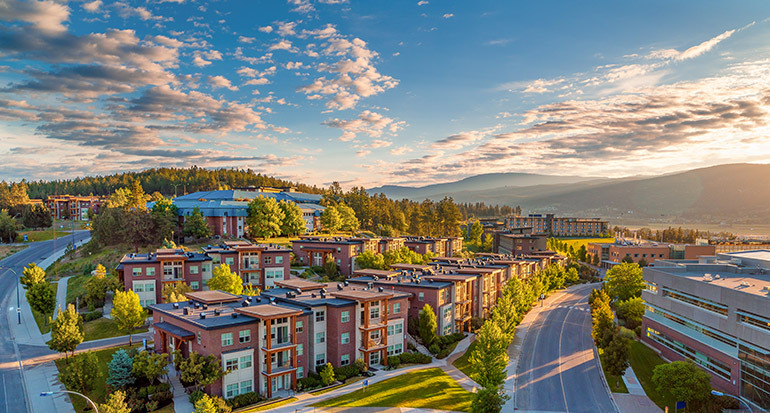 UBCO currently has space for 1,680 students to live on campus which allows it to meet its guarantee to provide student housing to every first-year student. But according to Associate Vice President, Finance and Operations Rob Einarson, as the campus community continues to grow, new investment in student accommodation is needed. Einarson adds that residences provide more than just a bed near classes. “Residences offer an opportunity for connections into a community of peers and other supports that we know improves student success and their experience of student life on campus,” he says. While it may seem like that leaves 75 per cent of students without housing, Shannon Dunn, director of business operations, says the demand for on-campus housing is offset by the fact that about 25 per cent of students come from the region and many others decide to live in other parts of the city. “Local students often prefer to live at home to save on rent. Students coming from outside the region often band together after their residence experience and transition to more independent living by renting an apartment downtown, closer to more amenities,” she says. Private development, Dunn clarifies, has played a key role in providing options for students and many of the neighbourhoods around campus have changed dramatically over the years, with once undeveloped hillsides now peppered with condo buildings. Dunn adds that the university’s commitment to student housing goes beyond just their first year. She gives the example of a recent flood in a private condo development near campus that left 100 students evicted by the building’s owners. That investment, says Einarson, comes in the form of $70 million that was recently approved by UBC’s Board of Governors for two residence buildings that have already been named the Skeena and Nechako Residences. “With funding now in place, I expect to see shovels in the ground very shortly and the projects are targeted to- be completed by fall 2021,” says Einarson. This isn’t the first time UBC’s Okanagan campus has seen this kind of growth in its residences. When the campus opened in 2005, 340 beds were available for its 3,500 students and just six years later, it had built additional residences providing 1,440 beds. Now that the student population has bloomed to nearly 10,000, the Nechako and Skeena residences will boost the number of available beds by 28 per cent, with each building housing 220 students. The Skeena Residence will be a six-storey facility, housing students in modified traditional bedrooms with standard amenities including lounges, informal study space, an activity room and laundry facilities. The Nechako Residence will also rise six storeys with the bottom two devoted to a 500-seat dining hall, quiet study and informal gathering space, a fitness room and casual recreation space. The top four storeys will feature traditional student rooms. Passivehaus certification is an internationally recognized high-performance building standard developed in Germany that focuses on the design, construction and operation of energy efficient buildings. Buildings designed and constructed to the Passivehaus standard use up to 90 per cent less space heating and energy consumption than conventional buildings—hence the term ‘passive’ as they need little active heating or cooling to stay comfortable throughout the year. Einarson says investments like this have allowed UBC Okanagan to reduce GHG emissions per student by 22 per cent since 2013, despite tremendous campus growth.